Leawo Blu-ray Player has been one of the best free Blu-ray player software for the recent years. The well designed user interface and great compatibility of the program make the product really stand out among all the free Blu-ray players on the market. As a built-in function module specially designed for Blu-ray disc playing, Virtual Remote Controller makes it possible to select specific chapter on the menu screen of a Blu-ray disc on Blu-ray Player. In case you have any question about this function module, today we will talk about everything you need to know about Leawo Virtual Remote Controller, what it is, how to activate Virtual Remote Controller and how to navigate Blu-ray menu with it, so stay tuned. Part 1: What is Virtual Remote Controller? Part 2: How do I use Virtual Remote Controller? Part 3: Oops, I can’t find my Virtual Remote Controller, what do I do? Virtual Remote Controller is a built-in function module of Leawo Blu-ray Player that is specially designed for the menu screen of Blu-ray discs. It enables you to navigate Blu-ray menu and select a specific chapter to play. The controller comes with five basic keys and functions as a real remote of an external Blu-ray/DVD player. 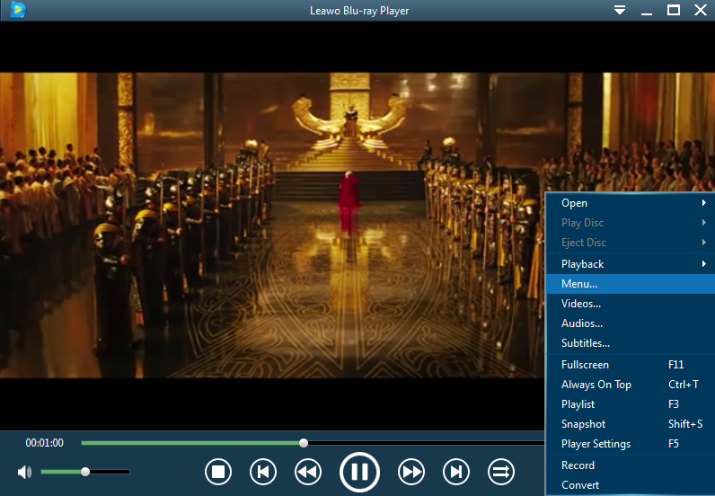 Use it to navigate the Blu-ray menu so that you can play any chapter you want on a Blu-ray disc. It is easy to use Virtual Remote Panel to navigate Blu-ray menu. Now I’ll show you how to activate/hide Virtual Remote Control panel, and how to operate on it. Step 1. Move your mouse to the top-left corner and click the last one of the four buttons, or right click on the playback screen and choose “Menu…”. Step 2. Either way will call out the Blu-ray menu and a tiny remote icon on the bottom roll of Blu-ray Player interface. Click the remote icon and the panel will pop out. There is a tiny “X” icon at the top-right corner of the panel, click on it and the panel will be hidden. There are five basic keys on the virtual remote panel. Use up/down/left/right button to navigate Blu-ray menu cursor, and “OK” to confirm selection. Worry not, here are some possible causes for Virtual Remote Controller to be not visible and ways to solve the problem. Situation 1: I can’t find the panel on the menu screen, how do I navigate Blu-ray menu? Solution: Reactivate Virtual Remote Controller. There is an “X” button at the top right corner of the Virtual Remote Controller, by clicking which you can hide the panel and make it invisible. 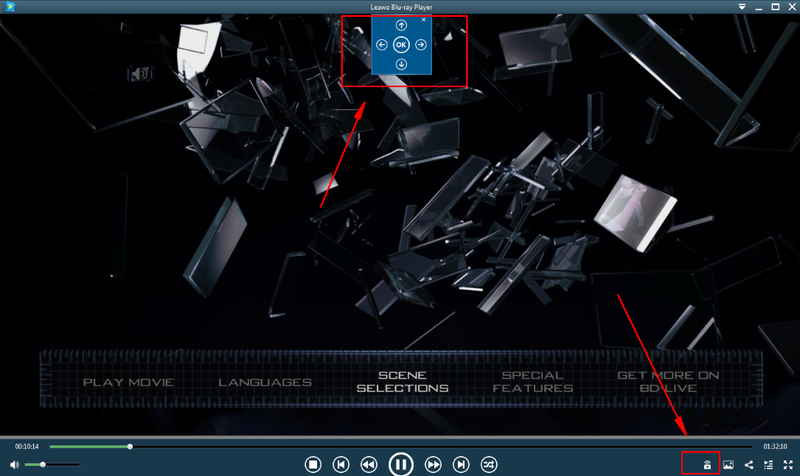 To reactivate the panel, simply click the remote icon on the bottom roll of Leawo Blu-ray Player interface (as shown on the image in part 2), and the panel will be back. Situation 2: I can’t see neither of the panel and the remote icon, what’s wrong? Possible cause: It’s inaccessible without Blu-ray menu. Solution: Call out Blu-ray menu first. Virtual Remote Controller panel and the remote icon always come with Blu-ray menu. To activate Virtual Remote Controller in the middle of a movie, you have to firstly click the menu button at the top left corner, or right click on the play back screen and choose “Menu…” to call out Blu-ray menu. As the remote icon now pops on the bottom roll of the interface, you can click on it to activate Virtual Remote Controller at this moment. Situation 3: Neither of the above solutions work. Possible cause: What you are playing is not a Blu-ray disc. Solution: Try use mouse to navigate menu. Virtual Remote Controller is specially designed for Blu-ray menu navigation, which means it’s not accessible when you are playing a DVD disc or videos of any other digital form. So how do I navigate DVD menu, you ask? Well, try select a chapter with your mouse, and be ready to be surprised. 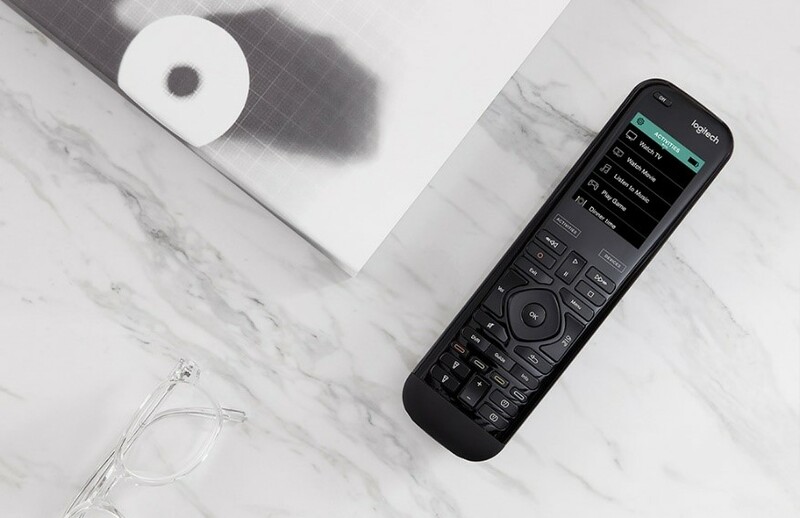 Here is everything you need to know about Leawo Virtual Remote Controller. If you haven’t tried the free Blu-ray player software, click the link above to download Leawo Blu-ray Player now and try this Virtual Remote Controller and all the other amazing features yourself.